Reprint of article originally posted on UN NEWS on Nov 29, 2018. Click here to access the original. These meetings have been vital to find a global consensus on an issue that requires a global solution. Although progress has been much slower than needed, the process — which has been as challenging as it is ambitious – has worked to bring all countries with very different circumstances, together. Progress has been made every step of the way. Some of the concrete actions taken so far prove one thing: climate action has a real positive impact and can truly help us prevent the worst. [JH] Thank you, It's also chock full of embedded links to important stuff. Great article. Many thanks for all that information. Its interesting to look inside the recent IPCC Special Report where you can find that the real-life data shows global temp in decline since April 2016. Its only the computer-generated estimates that are going up and up. Isn't that a little bit suspicious - especially since previous computer projections have been mostly incorrect? I can't help but wonder how much lower global temp might go. [DB] "real-life data shows global temp in decline since April 2016. 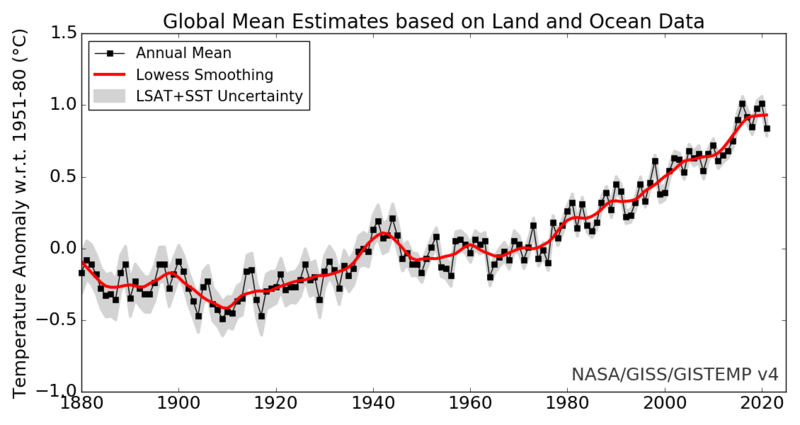 Its only the computer-generated estimates that are going up and up"
Please keep in mind that statistical significance testing shows that, for climate related changes, 17 years (Santer et al) are the bare minimum, with 30 years or more being typically used. With that in mind, the overall global trends show that the warming continues, unabated, unpaused and unhiatused to the present. The longer the running average/smooth, the more noise is filtered out of the trend, and the underlying warming signal is easier to discern. The only role computers play is to do the math (which could be done with pencil and paper; computers just make the job much faster). With an understanding of the forcings involved, it is clear that global temperatures will not be going down anytime soon. juddb. Take a long look at the global temperature record. It consists of pronounced up/down wiggles following at upward trend. The trend is climate - 30 year average - while the wiggles are "weather". Those wiggles are the El Nino/La Nina (ENSO) cycle which is chaotic and so far defies any long term prediction. Record temperatures are always set during an El Nino - which last peaked in Apr 2016. You expect temperatures to decline after that. You wont get a new temperature record till the next big El Nino. Climate models cannot pick El Ninos; what they can do pick the trend. Focus on that. 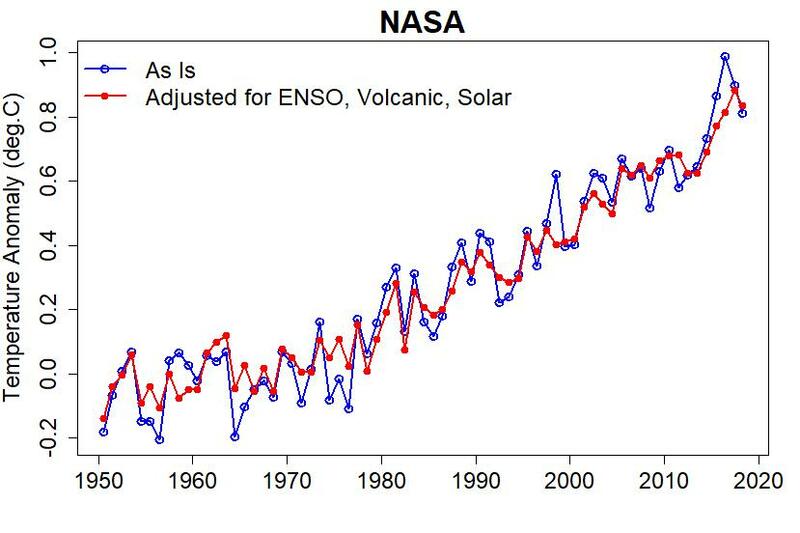 The ENSO cycle is just about redistribution of heat on an unevenly heated, wet planet. In the cool La Nina phase heat is being buried in the ocean. In El Nina, that surfaces and heats the atmosphere. How much lower? We havent had a strong La Nina since apr 2016, it mostly neutral but 70% chance of a weak El Nino in next few months so it will likely go back again. If you look at previous strong La Nina (2011 was a doozy), you will get an idea of far it can go down. 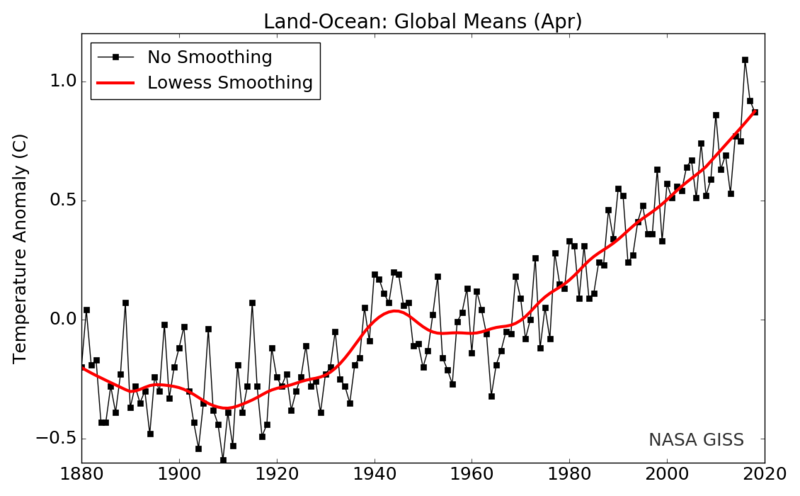 Please lets not have a repeat of the "Global warming stopped in 1998, 1995, 2002, 2007, 2010, ????" meme.